Watched by an estimated 1 million viewers per week, the new series of Sky One's Got To Dance has once again packed a prime-time punch. 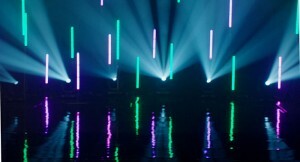 Perfect for use on-screen, Le Mark's Harmony gloss black dance floor has been selected as the dancing surface for the semi-finalists' pre-recorded 'Killer Move' video clip. The smooth finish of the floor allows for a controlled glide whilst retaining the perfect element of grip. It provides an exceptional level of dancing comfort for performers and a stunning high-gloss visual-effect for the viewers at home. Le Mark's Sharon Marshall said: "Keeping up with the fast paced performances and such varied dancing styles is no easy task for any dance floor. The robust yet forgiving nature of our Harmony Dance Floor is a key reason why it's one of our best sellers around the globe."